Lidl staff at the store in Tallaght, which was structurally damaged during an incident on Friday night, are to be redeployed. 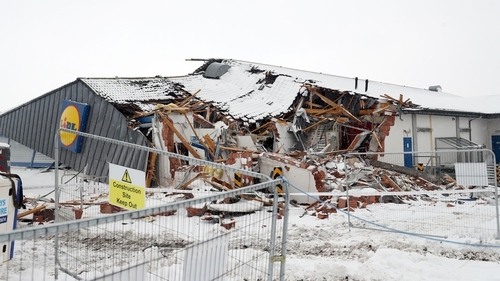 The supermarket at Fortunestown Lane was bulldozed and burgled during the incident, which took place during a major snow storm. In a statement, Lidl Ireland said that staff at the store met today and are to be redeployed to other stores in the area. It said 30 people work at the store on Fortunestown Lane, but none were present during the incident, as it was closed due to a Status Red weather alert. Lidl Ireland said staff have been "blown away" with the support they have received since the incident. Six men appeared in court charged in connection with the incident. They have been released on bail to appear in court again later this month.